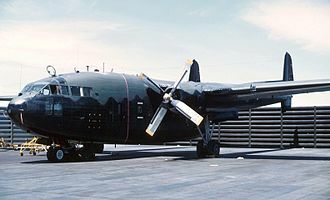 In 1960, the aging C-47s were replaced by the larger C-123J Provider; a tactical airlift transport—and the unit was again re-designated as the 144th Air Transport Squadron (Medium). 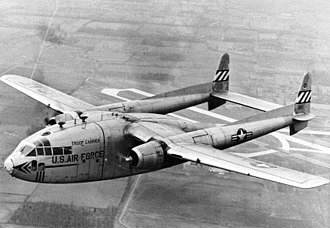 The C-123Js were equipped with wingtip mounted J-44 jet engines and could handle heavy payloads and also helped offset the drag of the ski modification added to give the aircraft the capability to be operated off frozen runways and icy surfaces. 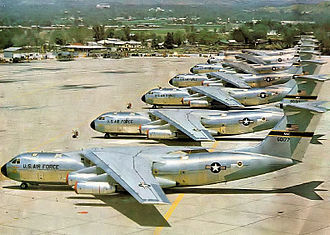 The C-123Js were transferred from the SAC 4083d Strategic Wing, Ernest Harmon Air Force Base, Newfoundland. 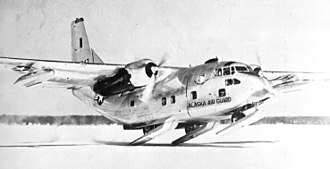 The 144th operated the only ski-equipped C-123Js in the Air Force system, and were far better equipment than the C-47As. On 27 March 1964, the largest earthquake in the recorded history of North America struck South-Central Alaska. 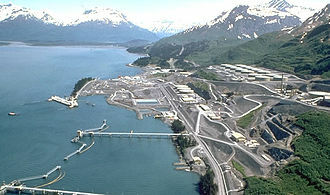 Tsunamis devastated Valdez, Seward and Kodiak. Gaping fissures, crumbled buildings and burst pipes dotted Anchorage. In the immediate aftermath, Major James Rowe arrived at Kulis from the airport, reporting that its control tower had been demolished. 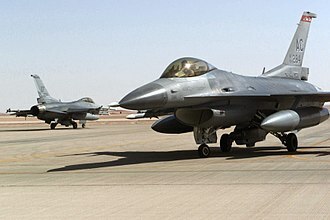 Two Air Guard members sped over with a wrecking truck, which they used to free three men trapped in the rubble. 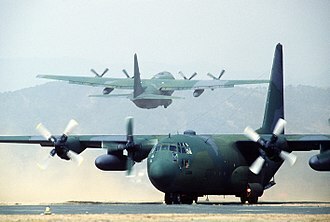 Rowe, meanwhile, started the engines of a C-123 and went aloft, serving as an emergency control tower and relaying what he could see to the rest of the world. The 144th Airlift Squadron performed humanitarian airlift missions for famine relief in Somalia and Rwanda, supported Operation Southern Watch in Saudi Arabia, achieved an Excellent rating in its first Operational Readiness Inspection from PACAF. 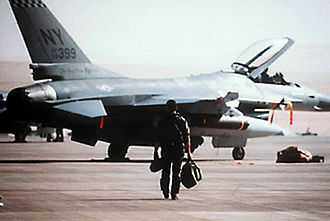 On 1 October 1996, the squadron entered a one-year conversion to deployment tasking from its previous in-place generation tasking. 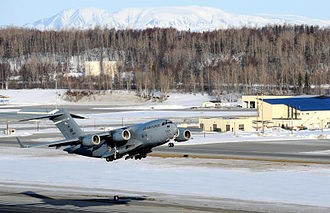 The 144th Airlift Squadron closed Kulis AGB and moved to facilities at JBER in February 2011. 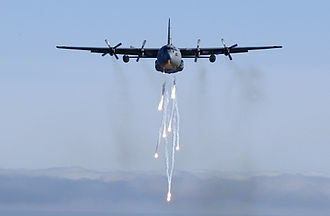 In March 2017, the squadron los the last of its C-130H aircraft, but remained active without aircraft. 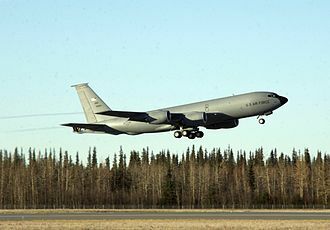 The decision was made to inactivate the junior 249th Airlift Squadron, which was flying the Boeing C-17 Globemaster III and transfer its personnel to the 144th, making the 144th an associate unit of the active 517th Airlift Squadron. ^ a b c Bedard, SGT David (August 9, 2018). "Air Guard C-17s move to 144th Airlift Squadron: Guardsmen honor their 249th Airlift Squadron heritage". 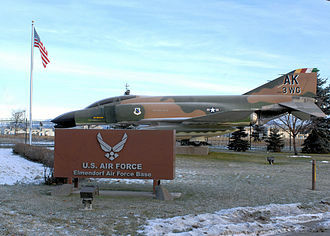 176th Wing Public Affairs. 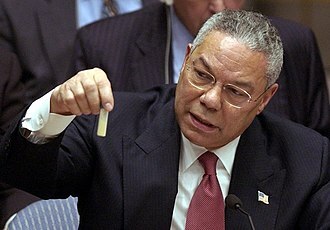 Retrieved December 18, 2018. The Lockheed T-33 Shooting Star is an American jet trainer aircraft. It was produced by Lockheed and made its first flight in 1948 piloted by Tony LeVier, the T-33 was developed from the Lockheed P-80/F-80 starting as TP-80C/TF-80C in development, designated T-33A. It was used by the U. S. Navy initially as TO-2 TV-2, as of 2015, Canadian-built examples remain in service with the Bolivian Air Force. The T-33 was developed from the Lockheed P-80/F-80 by lengthening the fuselage by slightly over three feet and adding a seat and flight controls. It was initially designated as a variant of the P-80/F-80, the TP-80C/TF-80C, design work for the Lockheed P-80 began in 1943 with the first flight on 8 January 1944. Following on the Bell P-59, the P-80 became the first jet fighter to enter squadron service in the United States Army Air Forces. As more advanced jets entered service, the F-80 took on another role—training jet pilots, the two-place T-33 jet was designed for training pilots already qualified to fly propeller-driven aircraft. Originally designated the TF-80C, the T-33 made its first flight on 22 March 1948 with U. S. production taking place from 1948 to 1959, the US Navy used the T-33 as a land-based trainer starting in 1949. 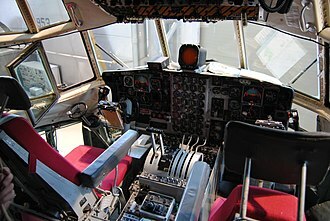 It was designated the TV-2, but was redesignated the T-33B in 1962, the Navy operated some ex-USAF P-80Cs as the TO-1, changed to the TV-1 about a year later. A carrier-capable version of the P-80/T-33 family was developed by Lockheed. The two TF-80C prototypes were modified as prototypes for an all-weather two-seater fighter variant which became the F-94 Starfire, a total of 6,557 Shooting Stars were produced,5,691 by Lockheed,210 by Kawasaki and 656 by Canadair. The two-place T-33 proved suitable as a trainer, and it has been used for such tasks as drone director. The T-33 was used to train cadets from the Air Force Academy at Peterson Field, the T-37 replaced the T-33 for Academy training in 1975. The final T-33 used in advanced training was replaced 8 February 1967 at Craig AFB, similar replacement occurred in the U. S.
The North American F-86 Sabre, sometimes called the Sabrejet, is a transonic jet fighter aircraft. Considered one of the best and most important fighter aircraft in that war and its success led to an extended production run of more than 7,800 aircraft between 1949 and 1956, in the United States and Italy. 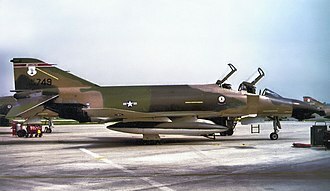 Variants were built in Canada and Australia, the Canadair Sabre added another 1,815 airframes, and the significantly redesigned CAC Sabre, had a production run of 112. The Sabre was by far the most-produced Western jet fighter, with production of all variants at 9,860 units. North American Aviation had produced the propeller-powered P-51 Mustang in World War II, by late 1944, North American proposed its first jet fighter to the U. S. Navy, which became the FJ-1 Fury. It was an unexceptional transitional jet fighter that had a wing derived from the P-51. Initial proposals to meet a United States Army Air Forces requirement for a medium-range, single-seat, in early 1945, North American Aviation submitted four designs. The USAAF selected one design over the others, and granted North American a contract to build three examples of the XP-86, despite the gain in speed, early studies revealed the XP-86 would have the same performance as its rivals, the XP-80 and XP-84. It was feared that, because these designs were advanced in their development stages. Crucially, the XP-86 would not be able to meet the top speed of 600 mph. The North American F-86 Sabre was the first American aircraft to take advantage of research data seized from the German aerodynamicists at the end of World War II. By 1944, German engineers and designers had established the benefits of swept wings based on designs dating back to 1940. Study of the data showed that a wing would solve their speed problem. Because development of the XP-86 had reached a stage, the idea of changing the sweep of the wing was met with resistance from some senior North American staff. Despite stiff opposition, after results were obtained in wind tunnel tests. 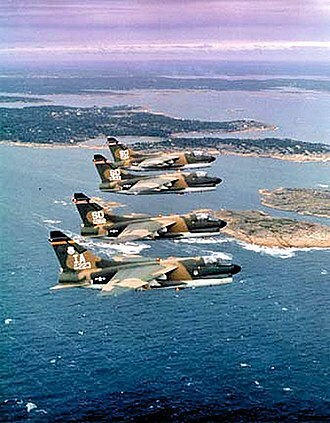 Many Sabres had the 6–3 wing retrofitted after combat experience was gained in Korea and this modification changed the wing airfoils to the NACA 0009-64 mod at the root and the NACA0008. 1–64 mod at the tip. Pacific Air Forces is a Major Command of the United States Air Force and is the air component command of the United States Pacific Command. The mission of Pacific Air Forces is to provide air and space power to promote U. S. interests in the Asia-Pacific region during peacetime, through crisis. PACAF comprises three numbered Air Forces, nine main bases and nearly 375 aircraft. The commands area of responsibility extends from the west coast of the United States to the east coast of Asia and from the Arctic to the Antarctic, the area is home to nearly two billion people who live in 44 countries. Not to be confused with Far East Air Force, the military organization of the United States Army in the Philippine Islands from 1941 to 1942. The beginnings of PACAF can be traced back to June 1944, Far East Air Forces was activated on 3 August 1944, at Brisbane, Australia. FEAF had actually created on 15 June 1944, and Fifth Air Force assigned to it. 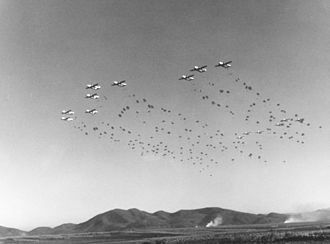 FEAF was subordinate to the U. S. Army Forces Far East, the creation of FEAF consolidated the command and control authority over United States Army Air Forces units widely deployed throughout the southwest Pacific in World War II. A realignment of forces was needed by the USAAF to better organize its forces in the Pacific for peacetime. 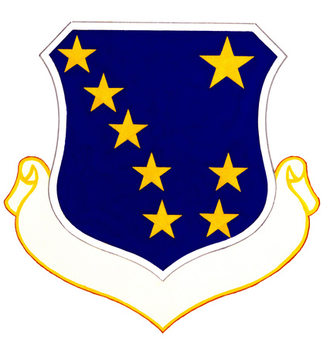 Shortly afterwards, Eighth Air Force was reassigned to the newly established Strategic Air Command on 7 June 1946, the major mission of PACUSA in the postwar years was occupation duty in Japan and the demilitarization of the Japanese society in conjunction with the United States Army. In addition, PACUSA helped to support atomic bomb testing in the Pacific Proving Grounds beginning with the Operation Crossroads test on Bikini Atoll in the Marshall Islands in 1946. 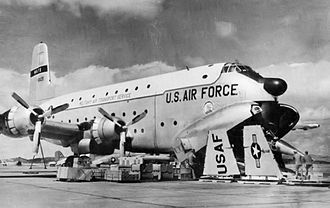 With the impending establishment of the United States Air Force as an independent service that year, on that same date, Seventh Air Force in Hawaii was inactivated with its organization absorbed by HQ, FEAF. On 25 June 1950, the forces of the Democratic Peoples Republic of Korea invaded South Korea. 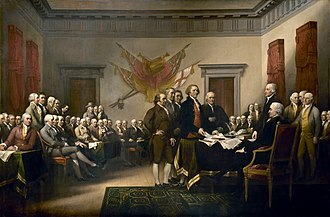 On 27 June, the United Nations Security Council voted to assist the South Koreans in resisting the invasion, president Harry Truman authorized General of the Army Douglas MacArthur to commit units to the battle. Taku Glacier is a tidewater glacier located in Taku Inlet in the U. S. state of Alaska, just southeast of the city of Juneau. Recognized as the deepest and thickest alpine temperate glacier known in the world and it is about 58 kilometres long, and is largely within the Tongass National Forest. The glacier was originally named Schultze Glacier in 1883 and the Foster Glacier in 1890, but Taku and it is nestled in the Coast Mountains and originates in the Juneau Icefield. It is the largest glacier in the icefield and one of the southernmost tidewater glaciers of the northern hemisphere. The glacier, which converges with the Taku River at Taku Inlet, has a history of advancing until it blocks the river, creating a lake, the most recent of these advances occurred in 1750. The glacier has advanced 7.75 kilometres since 1890, and it is the only advancing glacier of the 20 major glaciers of the Juneau Icefield. If the advance continues it will block the river. Since 1946, the glacier has been monitored by the Juneau Icefield Research Program, the advance is due to a positive mass balance, that is, more snow accumulates than snow and ice melt. The Curtiss C-46 Commando is a transport aircraft derived from the Curtiss CW-20 pressurised high-altitude airliner design. Early press reports used the name Condor III but the Commando name was in use by early 1942 in company publicity. 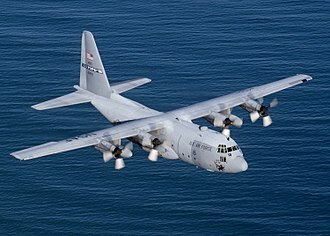 It was used as a transport during World War II by the United States Army Air Forces and the U. S. Navy/Marine Corps. The C-46 served in a role to its Douglas-built counterpart, the C-47 Skytrain. 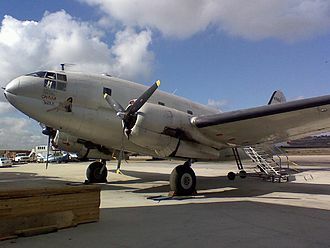 At the time of its mass-production, the C-46 was the second-largest, the type continued in U. S. Air Force service in a secondary role until 1968. The C-46 continues in operation as a cargo transport for Arctic. The prototype for what would become the C-46, the Curtiss CW-20, was designed in 1937 by George A, page Jr. the chief aircraft designer at Curtiss-Wright. 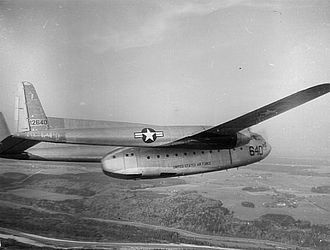 The CW-20 was a private venture intended to compete with the four-engined Douglas DC-4, the CW-20 had a patented fuselage conventionally referred to as a figure-eight which enabled it to better withstand the pressure differential at high altitudes. This was done by having the sides of the fuselage creased at the level of the floor that not only separated the two portions but shared in the stress of each, rather than just supporting itself. The main spar of the wing could pass through the section which was mainly intended for cargo without intruding on the passenger upper compartment. Engineering work involved a commitment from the company and incorporated an extensive amount of wind tunnel testing at the California Institute of Technology. The resultant design was a large but aerodynamically sleek airliner, incorporating the cockpit in a glazed dome. The engines featured a unique nacelle tunnel cowl where air was ducted in and expelled through the bottom of the cowl, reducing turbulent airflow, after a mockup was constructed in 1938, Curtiss-Wright exhibited the innovative project as a display in the 1939 New York Worlds Fair. The company approached many airlines in order to obtain their requirements for an advanced airliner, no firm orders resulted, although 25 letters of intent were received, sufficient to begin production. The 1964 Alaskan earthquake, known as the Great Alaskan earthquake and Good Friday earthquake, occurred at 5,36 P. M. AST on Good Friday, March 27, across south-central Alaska, ground fissures, collapsing structures, and tsunamis resulting from the earthquake caused about 139 deaths. 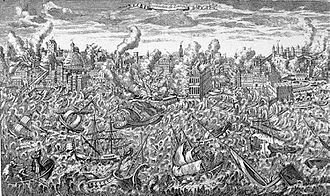 Lasting four minutes and thirty-eight seconds, the magnitude 9.2 megathrust earthquake was the most powerful recorded in North American history, soil liquefaction, fissures and other ground failures caused major structural damage in several communities and much damage to property. Anchorage sustained great destruction or damage to many inadequately earthquake engineered houses, two hundred miles southwest, some areas near Kodiak were permanently raised by 30 feet. Nearby, a 27-foot tsunami destroyed the village of Chenega, killing 23 of the 68 people who lived there, survivors out-ran the wave, climbing to high ground. 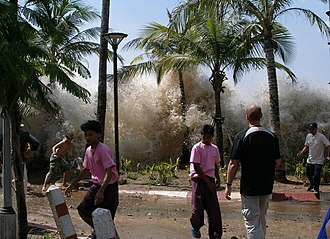 Post-quake tsunamis severely affected Whittier, Seward and other Alaskan communities, as well as people and property in British Columbia, Oregon, tsunamis caused damage in Hawaii and Japan. Evidence of motion directly related to the earthquake was reported from Florida. Alaska Standard Time, a fault between the Pacific and North American plates ruptured near College Fjord in Prince William Sound, the epicenter of the earthquake was 12.4 mi north of Prince William Sound,78 miles east of Anchorage and 40 miles west of Valdez. 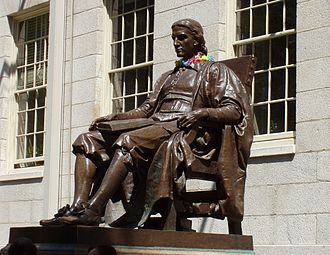 The focus occurred at a depth of approximately 15.5 mi, ocean floor shifts created large tsunamis, which resulted in many of the deaths and much of the property damage. Large rockslides were caused, resulting in property damage. Vertical displacement of up to 38 feet occurred, affecting an area of 100,000 miles² within Alaska, studies of ground motion have led to a peak ground acceleration estimate of 0. 14–0.18 g. The Alaska earthquake was a subduction zone earthquake, caused by an oceanic plate sinking under a continental plate, the fault responsible was the Aleutian Megathrust, a reverse fault caused by a compressional force. This caused much of the ground which is the result of ground shifted to the opposite elevation. The Tanana River /ˈtænənɑː/ is a 584-mile tributary of the Yukon River in the U. S. state of Alaska. According to linguist and anthropologist William Bright, the name is from the Koyukon tene no, the rivers headwaters are located at the confluence of the Chisana and Nabesna rivers just north of Northway in eastern Alaska. The Tanana flows in a northwest direction from near the border with the Yukon Territory, in central Alaska, it emerges into a lowland marsh region known as the Tanana Valley and passes south of the city of Fairbanks. In the marsh regions it is joined by several tributaries, including the Nenana. It passes the village of Manley Hot Springs and empties into the Yukon near the town of Tanana, Ice on the river accumulates each winter to an average maximum thickness of 43 inches at Nenana. The Nenana Ice Classic, begun in 1917, is a guessing game about the date of the ice break-up. In October or November, after the freeze has begun, a tripod is planted in ice in the middle of the river, the tripod is connected to an on-shore clock that stops when the tripod begins to move during the spring thaw. 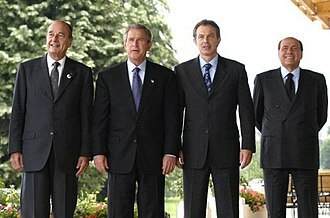 Over the years, the date has varied from April 20 to May 20. Betting on the time of the break-up takes the form of a lottery. Human habitation of the Yukon basin, including the Tanana watershed, several sites in the watershed have produced evidence of occupation by Paleo-Arctic people. Later residents include people of the Tanana tribe, which has had a presence in the region for 1,200 years, in the summer of 1885, Lieutenant Henry Tureman Allen of the U. S. Army undertook the first recorded exploration of the Tanana River. In 1883, Lieutenant Frederick Schwatka and his party had entered the Yukon watershed by way of Canada, allens goal was to find an all-Alaska route to the Yukon River. He and his men ascended the Copper River, crossed into Tanana River drainage, during the five-month trip, the Allen party mapped the courses of the Copper and Koyukuk rivers. In the early 21st century, the basin is largely unchanged by human activity. Fairbanks, an area with about 80,000 residents in 2005, is a center of placer gold mining. Kodiak is one of seven communities and the main city on Kodiak Island, Kodiak Island Borough, in the U. S. state of Alaska. All commercial transportation between the island and the outside world goes through this city either via ferryboat or airline. 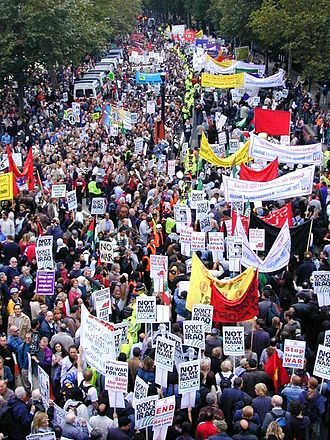 The population was 6,130 as of the 2010 census,2014 estimates put the population at 6,304. 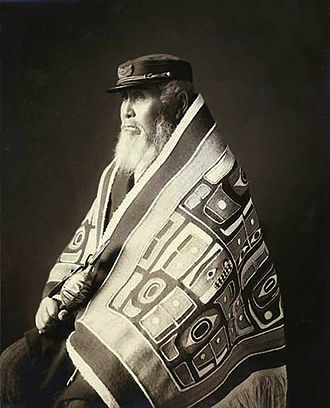 Originally inhabited by Alutiiq natives for over 7,000 years, harvesting of the areas sea otter pelts led to the near extinction of the animal in the following century and led to wars with and enslavement of the natives for over 150 years. After the Alaska Purchase by the United States in 1867, Kodiak became a fishing center which continues to be the mainstay of its economy. A lesser economic influence includes tourism, mainly by those seeking outdoor adventure trips, halibut, the unique Kodiak bear, Sitka deer, and mountain goats attract hunting tourists as well as fishermen to the Kodiak Archipelago. 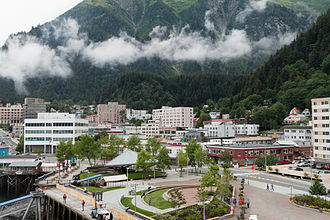 The Alaska Department of Fish and Game maintains an office in the city, the city has four public elementary schools, a middle and high school, as well as a branch of the University of Alaska. An antenna farm at the summit of Pillar Mountain above the city historically provided communication with the world before fiber optic cable was run. Transportation to and from the island is provided by service on the Alaska Marine Highway as well as local commercial airlines. 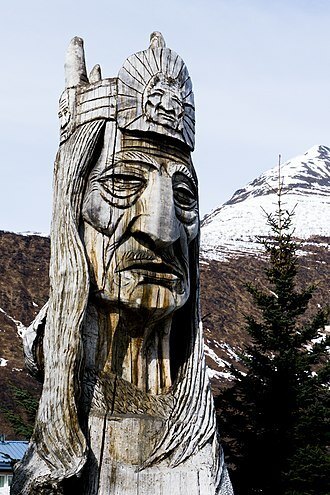 The Kodiak Archipelago has been home to the Alutiiq for over 7,000 years, in their language, kadiak means island. In 1763, the Russian explorer Stephan Glotov discovered the island and he was followed by the British captain James Cook fifteen years later, who first recorded Kodiak in his journals in 1778. 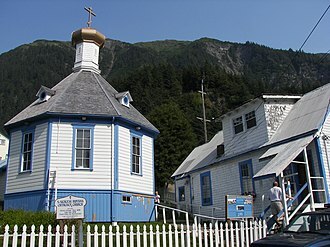 In 1792, the Russian Shelikhov-Golikov Company chief manager Alexander Baranov moved the post at Three Saints Bay to a new site in Pauls Harbor and this developed as the nucleus of modern Kodiak. Baranov considered Three Saints Bay a poor location because it was too indefensible, the relocated settlement was first named Pavlovskaya Gavan. The warehouse still stands as the Baranov Museum, because the First Native cultures revered this animal and would never harm it, the Russians had wars with and enslaved the Aleuts occurred during this era. Fairbanks /ˈfɛrbæŋks/ is a home rule city and the borough seat of the Fairbanks North Star Borough in the U. S. state of Alaska. 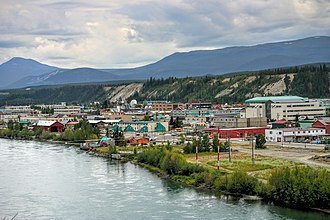 Fairbanks is the largest city in the Interior region of Alaska,2014 estimates put the population of the city proper at 32,469, and the population of the Fairbanks North Star Borough at 99,357, making it the second most populous metropolitan area in Alaska. Fairbanks is home to the University of Alaska Fairbanks, the campus of the University of Alaska system. Captain E. T. Barnette founded Fairbanks in August 1901 while headed to Tanacross, the steamboat on which Barnette was a passenger, the Lavelle Young, ran aground while attempting to negotiate shallow water. Barnette, along with his party and supplies, were deposited along the banks of the Chena River 7 miles upstream from its confluence with the Tanana River, the two met Barnette where he disembarked and convinced him of the potential of the area. Barnette set up his trading post at the site, still intending to make it to Tanacross. Teams of gold prospectors soon congregated in and around the newly founded Fairbanks, they built drift mines, agricultural activity still occurs today in the Tanana Valley, but mostly to the southeast of Fairbanks in the communities of Salcha and Delta Junction. During the early days of Fairbanks, its vicinity was a producer of agricultural goods. What is now the northern reaches of South Fairbanks was originally the farm of Paul J. Rickert, Farmers Loop Road and Badger Road, loop roads north and east of Fairbanks, were home to major farming activity. Badger Road is named for Harry Markley Badger, a resident of Fairbanks who established a farm along the road. Ballaine and McGrath Roads, side roads of Farmers Loop Road, were named for prominent local farmers. 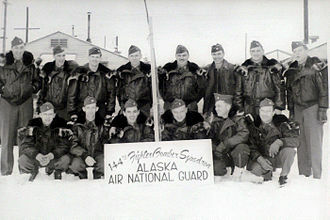 The Haines - Fairbanks 626 mile long 8 petroleum products pipeline was constructed during the period 1953-55, the presence of the U. S. military has remained strong in Fairbanks. 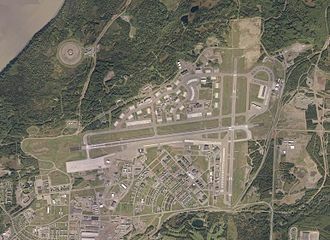 Ladd became Fort Wainwright in 1960, the post was annexed into Fairbanks city limits during the 1980s, Fairbanks suffered from numerous floods in its first six decades, whether from ice jams during spring breakup or due to heavy rainfall. 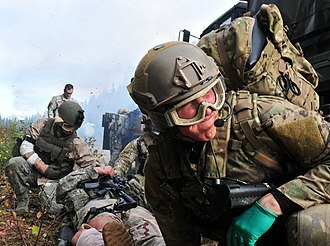 212th Rescue Squadron pararescueman, prepares to move a patient on a litter while the HH-60G Pavehawk helicopter lands during training at Joint Base Elmendorf-Richardson. View across the Taku Glacier. An aerial view of a small corner of Taku Glacier, 2007. Aerial view of Seward, Alaska in the 1990s, looking north. The mouth of the Resurrection River and the base of Mount Marathon are visible. 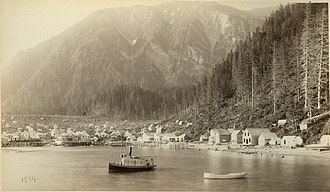 Boats in the harbor, with the snow-capped peak of Mount Alice across the bay to the east in the background. The Trans-Alaska Pipeline crosses beneath several rivers, but has a pipeline bridge where it crosses the Tanana just north of Delta Junction. Bridge over the Tanana River in Nenana. An Indian Air Force Sukhoi Su-30MKI undergoes post-flight maintenance during the Red Flag exercise in 2008. An image partially depicting the headline of the June 3, 1942 edition of the Times. 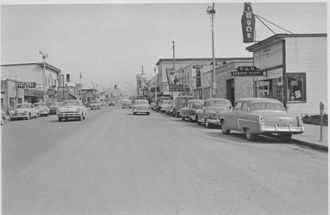 Fourth Avenue in Anchorage in 1953, looking east from near I Street. The offices of the Times are several buildings down on the right. The Times would remain in that location until its closing, greatly expanding its offices and plant during the 1970s. That latter building stands today as the administrative headquarters of the Alaska Court System.